Leeds driving lessons. Learn to drive with quality driving lessons, suited to you, with a friendly, patient and professional, Leeds driving instructor. Not driven for a while or don't feel confident about certain aspects of driving? Taking refresher lessons will help give you the confidence to drive safely and competently on the road. Follow a course covering urban, rural, night time, all weather, motorways and dual carriageway driving to improve your skills and gain confidence after passing your driving test. Take a motorway driving lesson to safely practice and understand the specific rules and conditions the motorways bring. Leeds Driving Lessons. MD driving. Quality professional driving lessons in Leeds. Friendly, patient and professional approach to teaching. Lessons adapted to your specific needs. Learn to drive in an easy and enjoyable way. Flexible lesson times to suit you. Successfully teaching people in Leeds to be confident and safe on the road and to easily pass their driving test. Friendly, patient and professional approach to teaching. Lessons adapted to your specific needs. Quality not quantity, many of my customers have passed 1st time with fewer than 25 hours of lessons. Learn to drive in an easy and enjoyable way. Flexible lesson times to suit you. 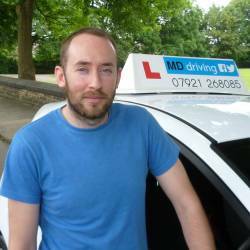 Learn to drive with a friendly, patient and professional driving instructor. "Not my first instructor but by far the best. Easily passed my test first time with Martin's help and enthusiasm. I highly recommend new drivers to get in touch with him as he's easy to get along with and you'll feel comfortable straight away." "Martin is a gracious and patient instructor. Never did I feel rushed, anxious or out of my depth. He pitched each lesson very well and gradually brought my driving confidence up. I would thoroughly recommend him to anyone thinking of learning to drive." "Martin is a marvelous instructor; very patient, calm and positive. For me he turned learning to drive from a complicated headache into something that suddenly seemed quite simple. I'd been having lessons on and off with other instructors for years previously and had honestly reached the point where I thought I would probably never pass, but with Martin I finally found the confidence to do it!" "Martin is a great teacher and knows how to make you progress with confidence. I passed my test with less than 30 hours of driving which is great! I highly recommend taking lessons with Martin."